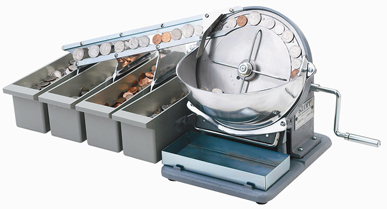 Take the work out of sorting coins with our Manual Coin Sorters. These Coin Sorters sort up to 1,000 mixed coins per minute and sorts them into individual bins. These Coin Sorters will sort quarters, nickels, dimes, and pennies with the simple turn of the crank and you are done. Our Manual Coin Sorter will even sort wet coins for you from car washes and water parks. Our Automatic Coin Sorters sort quarters, nickels, dimes, and pennies with the flip of a switch. Simply pour a large amount of mixed coins into our Automatic Coin Sorter and let this machine do all the work. Each coin will be rapidly separated into the individual removable coin boxes. Sort 1,000 coins per minute of any combination of mixed coins. 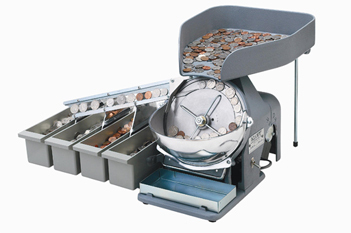 Customized Coin Sorters are available for coins and tokens up to 1.125" in diameter. For more information please call 1-800-233-0828.